Every Ontarian deserves security and dignity in retirement and yet by every measure most workers face the prospect of an uncertain future. Despite public demand, provincial support and sustained lobbying from Canada’s labour movement, the Harper government has repeatedly rejected the call for an expanded Canada Pension Plan (CPP). The result is a desperate situation where two out of every three Canadians without a workplace pension may expect to languish on sub-poverty CPP benefits when they should be enjoying their golden years. The average Ontario retiree receives a meager $6,800 a year from the CPP. Yet, dwindling personal savings and ballooning household debt paint a bleak retirement future for Ontarians living in a province that has shed nearly 300,000 manufacturing jobs since 2000, and where half a million people (one in ten workers) toil for minimum wage. With the number of seniors expected to double by 2036, it is fair to say that the lack of retirement security is the crisis of our times. This is why the OFL stands firmly behind the Ontario Retirement Pension Plan, but Ontario workers are counting on the government to get it right. 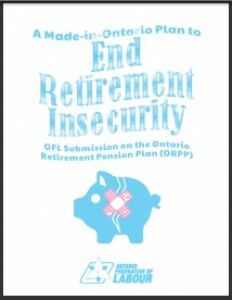 The OFL membership believes that mandatory universality is key to the success of expanded retirement security. Universal programs are time-tested in Canada—the Canada Pension Plan, Medicare, and Employment Insurance all function well and are relatively politically resilient, precisely because they are designed as universal programs. This submission is designed to provide a road map for just such a plan. The recommendations contained in this submission are supported by unionized workers across the province because they would expand pension benefits to every worker and ensure that no one retires into poverty. Ensure that the ORPP is modeled on the CPP such that it could be folded into a future CPP expansion. Language specifying plan funding should reflect the secure nature of the benefit being promised. Design the ORPP to have universal coverage and include any employees who could benefit from the ORPP. Work closely with other provinces to ensure that ORPP accrued pensions can be carried with workers that leave the province. The Ontario government should consider providing targeted refundable tax credits on ORPP contributions in order to offset a greater share of low-income earners’ contributions to the ORPP. Investigate a reduction in the maximum allowable Registered Retirement Savings Plan contribution and allocate the savings to providing tax assistance for low income earners contributing to the ORPP. Work with the federal government to prevent the clawback of GIS benefits for those retirees receiving ORPP benefits. The ORPP should cover Ontarians in paid employment as well as the self-employed as much as possible, with the latter paying both employer and employee portions. ORPP assets should be managed independently by a public investment board accountable to the ORPP Board of Directors. Workers should have direct representation or representation through unions on the governing body of the ORPP. The Ontario government should explicitly exclude PRPPs as comparable plans to the ORPP.